Rascal is a cat. My cat. I didn’t ask for him, he just sort of... happened to me. But that’s just how it works sometimes, isn’t it? When a mysterious mewling package arrives in the mail, one busy young woman’s life changes forever. Rascal lives up to his name, filling every day with wild adventures and long naps: brave expeditions into closets, fierce battles with curtains, and wrestling with slumbering giants... Sometimes she’s tempted to throw him out the window. He’s lucky he’s cute. At 128 pages, Jean-Luc Deglin paints a purring portrait of one unforgettable black cat, an elegant inky swirl in a world of striking blue tones. 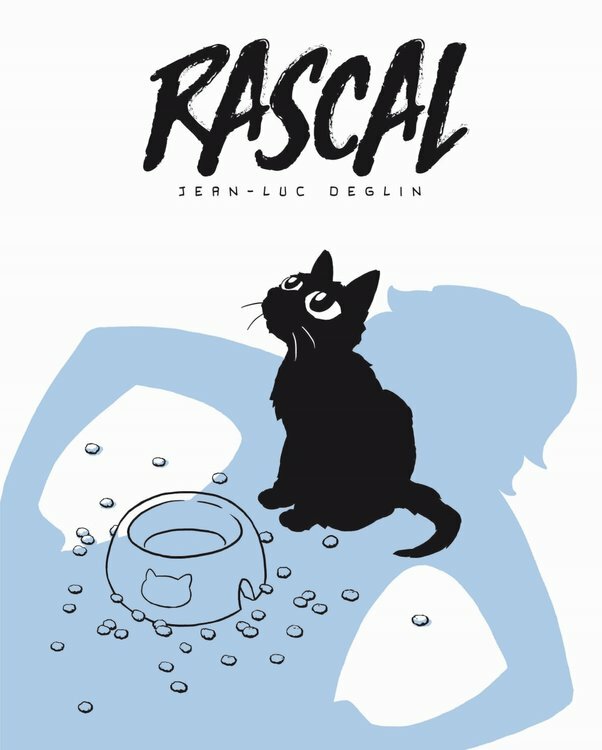 Hilarious and heartwarming, exasperating and enchanting, Rascal captures the full range of emotions that come with keeping God’s cutest killing machine as a pet.